Oh how I miss my mom making breakfast tacos for us every Saturday morning. And then on Sunday’s we would go to church and our church would always have breakfast afterwards with the best breakfast tacos. Now I have to make them myself to get that delicious flavor. But that’s ok because it is so worth it. When I first started traveling to Lubbock for work, I found a breakfast place close that had amazing sausage kolaches and just ok breakfast tacos. Only they called them burritos. Um no. I can’t do it. These will always be breakfast tacos to me. This is my special treat every once in a while and now that I can freeze them, I can have them occasionally during the week too. Add about 2 tablespoons canola oil to sauté pan and heat to medium heat. Once pan is hot, add diced potatoes. Season with seasoning salt and pepper and mix together. Cover pan and cook for about 20 minutes, stirring every five minutes. In the last five minutes, add bell peppers and stir. While potatoes are cooking, heat cast iron pan to medium high heat. Add about a teaspoon of canola oil. Once hot add pork sausage and stir with a spoon to break apart. Cook until browned. *Note: I use a stirrer similar to this Chop Turner to break apart my meat. Crack three eggs in a bowl and add milk, salt and pepper. Whisk together until incorporated. Pour egg mixture into pan with sausage. Stir together and cook until eggs are done. Warm up tortillas. *Note: I like to get my tortillas from Rosa’s restaurant because they are homemade and good and I always have some on hand. Or you can make them from scratch with this tortilla recipe. 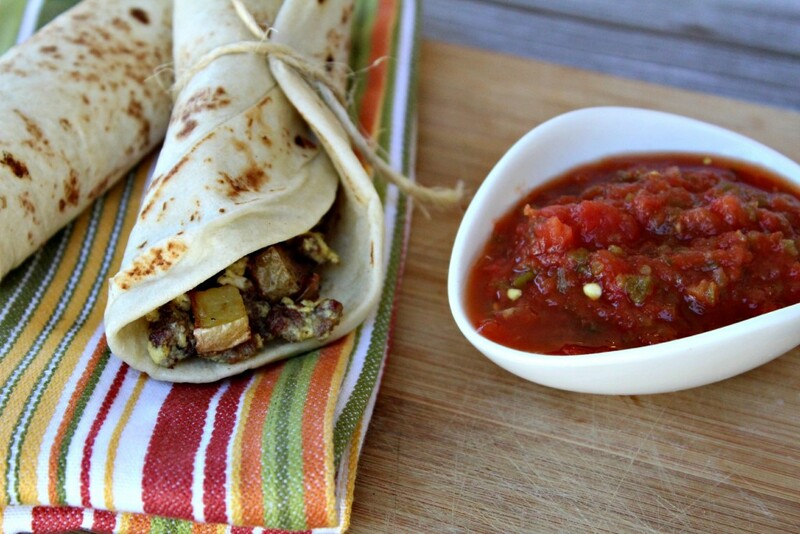 Make tacos by adding potatoes with egg and sausage mixture in tortilla. Roll and eat. Serve with salsa and cheese if you like. 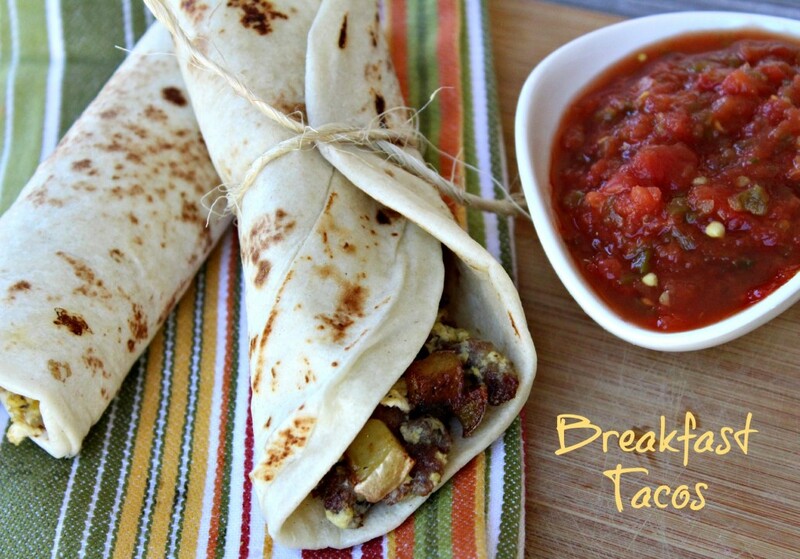 To freeze extra breakfast tacos, make a breakfast taco and wrap in Saran Wrap and then place in a freezer bag. Make sure all the air is out of the bag and label your bag and place in the freezer. * Contains an affiliate link to a product I use in my kitchen.